You are presented with a task; this task includes having to re-paint every room within your house, including the guest bedroom and the bathrooms. You look at this project and realize how much time it will take by using a paint roller and a paint brush. After taking a few deep breaths, the realization comes to you – you should buy a Paint Sprayer. Utilizing a paint sprayer will help save your arms and legs, and will not be nearly as messy compared to the conventional method of painting. When you arrive at the store, however, you realize there are a few different options. What are the most important factors in determining which paint sprayer is best for your needs? How many different settings do you actually need? Within this buying guide, we’ll review some of the key factors in figuring out which Paint Sprayer is best for you and your needs. There will also be a review of five of the top Paint Sprayers within the market, which should also narrow down your choices. With all of that in mind, let’s get started! 1 What makes a Great Paint Sprayer? What makes a Great Paint Sprayer? When looking at all the different models of paint sprayers, there are three main types of sprayers. 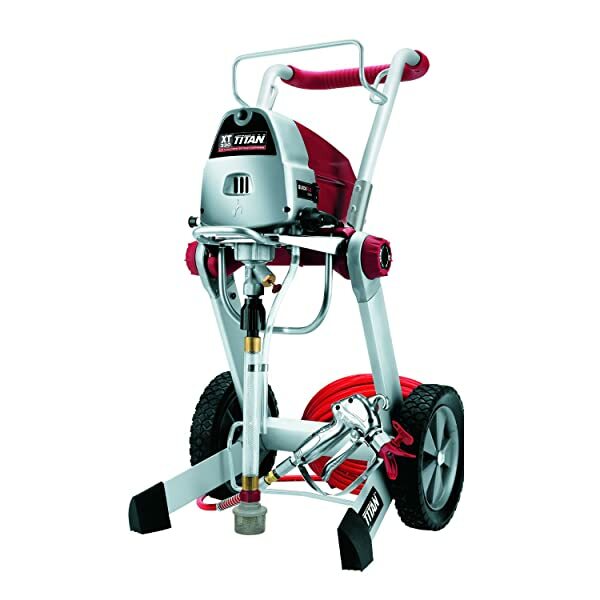 Airless – This is the type of machine you will see a contractor typically use. It is very big and bulky, and the paint comes out as more of a mist. It requires a generator to help produce results, meaning you can feel confident in the power it provides. There is no surface that this cannot paint, however, it is very big and bulky, and can be an overkill depending upon the scope of your project. High Volume, Low Pressure (HVLP) – This particular type of paint sprayer is known for ensuring more paint hits the surface of where you are painting, meaningless paint hangs in the air. This is a great paint sprayer to have if you have a lot of tight spaces, or if you are painting objects which are smaller in scope. Hand-Hand Cup – This is the most common paint sprayer you will see within the hardware stores. The paint sprayer is directly attached to the paint, thru either a tube which drops directly into the paint can, or it has a cup which is housed directly on the gun which needs to be re-filled on a constant basis. It will typically run on electricity, although there are some models which operate off of a battery. Another thing to consider is how fast you need the paint to come out. There are many companies which will boast about how many square feet it can paint within a certain time period. However, if you have a paint sprayer that can do 1,500 square feet in 20 minutes versus another which can do 1,600 square feet in 20 minutes, how much more money is that worth to you? How many square feet do you need to paint? If you only have 1,000 square feet to paint, then getting a sprayer that can paint quickly may not be the best fit for you, as you need to ensure you have the right coverage. In addition to speed, another thing to consider is how many different nozzle heads it comes with. There are nozzle heads which can give you a wider spray along the wall, as well as a narrow stream. There are some which are great for trim work, and others which are best suited for large, open walls. Knowing what kind of project you are working on should determine the types of nozzles you need, whether it comes in the original package, or if it is available for separate purchase. 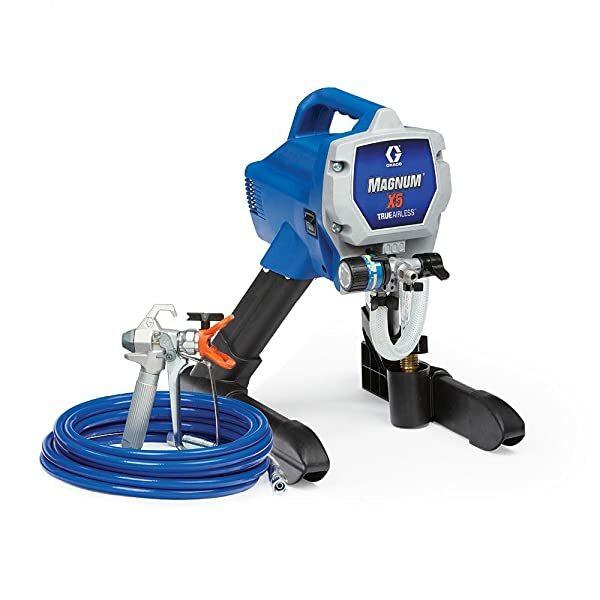 This flexible airless paint sprayer from Graco Magnum can spray up to .27 gpm and has a tube so you can pump in the paint directly from any one gallon or five-gallon container. It will spray most types of paint, including heavy latex, as well as regular latex and stains. It will not handle paint with texture within it well, as the texture will get stuck within the tubing and the sprayer. This sprayer has a button which makes it easy to prime, meaning it will be ready for use within seconds of turning it on. The sprayer can be hooked to a garden hose, which will allow you to easily clean the unit, so it will be ready to use for the next project. The pressure control knob along the unit makes it very easy to provide the right amount of pressure needed for any project from this unit. This paint sprayer comes with a portable stand, so you can easily set it up to paint one particular area, or easily move it around to the areas where you need paint to be applied. This paint sprayer is very lightweight and easy to carry, making it a very good portable option for you, whether you have projects to complete which are close together or far apart in distance. 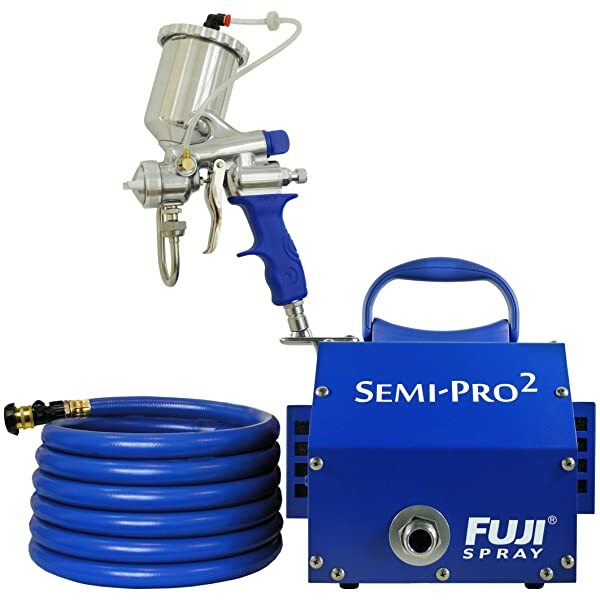 This HVLP paint sprayer from Fuji comes with a spray gun which is made with the professional in mind. It is encased completely in metal, providing you with a non-stick surface which will not bleed thru the gun. This means that the paint will not be spread to areas within the gun where it doesn’t need to be, so it’ll help keep the gun clean for every use. There is also an adjustable control which allows you to determine the pattern and the speed of the fan. By having this adjustable control, you do not have to be committed to only one type of pattern or speed. This will allow you to attempt different settings to see which one you like best and find the one which is best for you and your needs. The standard hose is 25 feet, and it comes with a valve to help you control the air pressure, so you can reduce the effect of an overspray. You can put a longer hose on this paint sprayer, and it will still perform at a very high level. The paint sprayer comes with six different needle and cap sets, and it runs off of a 2-stage system with a 1400 watt motor. This kind of power will help ensure you have enough power to cover any project with the paint or stain of your desire, no matter how long your hose is or the needle and cap set combination you choose. This HVLP paint sprayer from Wagner is powered by electricity, and is very compact. Because of its diminutive size, it can reach into a lot of tight and close spaces that other sprayers cannot get into. It also comes with two different cup sizes, so you can have a controlled amount of paint or stain to help ensure you do not overspray a certain area. This two cup system gives you the flexibility needed to ensure you don’t have to fill up the paint cups very often, and that you will have enough paint to finish the project you are working on. There is a control aspect which allows you to determine the right amount of pressure being applied to the paint. This control knob allows you to create streams which are anywhere between 1 inch up to 10 inches. This will allow you to find the correct stream which you are comfortable with to complete any painting or staining project. There are also three different pattern sets to choose from, which gives you a very wide assortment of combinations to choose from. No matter the size of your project, or the size of the area you are working within, this paint sprayer can reach into that area and give you the coverage you desire. 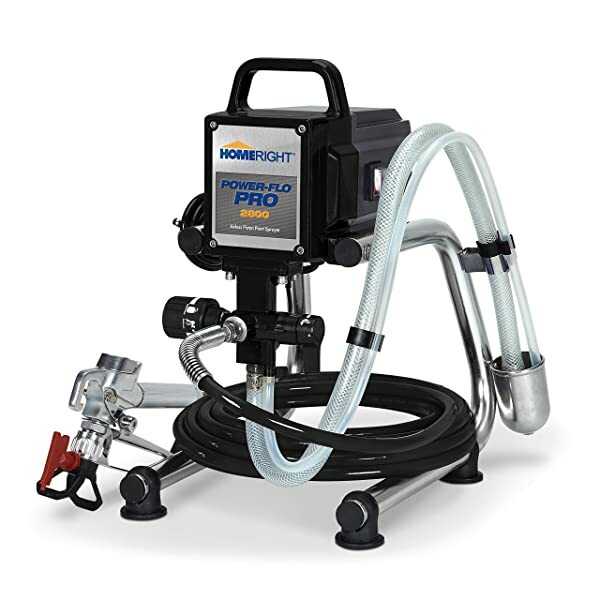 This paint sprayer from HomeRight is engineered for the more professional painter. This sprayer comes with a 2800 PSI motor, which is powered by a ½ Horsepower motor. 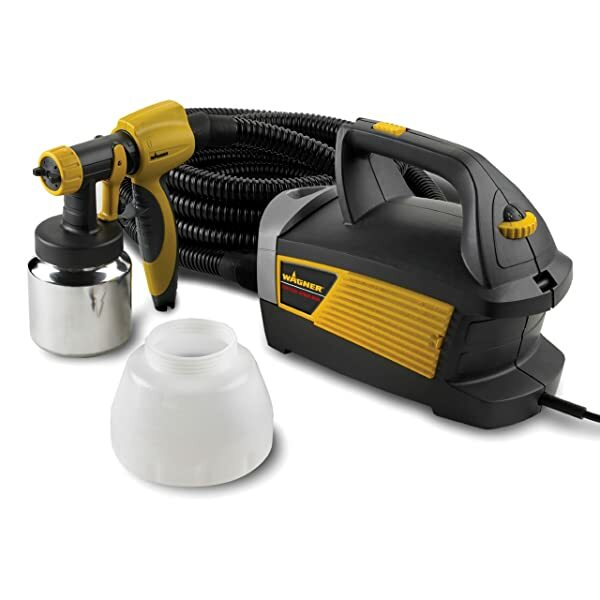 This powerful paint sprayer will be able to power any amount of paint for as long as you need during any project. This is evident as you are spraying heavy latex paint, regular latex paint or even stains. No matter the material, you can push it thru the hose, no matter if it is 10 feet or 100 feet long. This paint sprayer also has a stand which allows the sprayer to sit up securely, which means it will stay stable while you are working. The spray tips are reversible, meaning they are easy to clean, especially when they get clogged. This is very helpful during times when you need to quickly clean out the tips so you can continue to work on a project and not be delayed for too long of a time. The valve is wear-resistant, meaning it will stay very durable, whether you use this every day, or once every six months. Can spray up to .24 gpm and this unit includes a swivel for the paint spray gun, so you can reach the harder areas around the house. This is a vital aspect to the paint sprayer, as it is not meant to be compact, but with the swivel head, you can be assured you can reach any area which needs to be covered with paint or stain. This large paint sprayer comes on wheels, which makes it very portable and easy to use around your entire house. This unit weighs over 50 pounds and comes with a 50-foot hose. The wheels are necessary so you can move this heavier paint sprayer around to the areas you need. You can attach a different size hose to this paint sprayer, so you can either reach the up to close walls as you need, or you can have a longer hose which will allow you to get close to the area you are painting where it will be difficult to carry the heavy paint sprayer. The paint sprayer can handle a large variety of materials, including stains and heavy latex. This versatility within this paint sprayer allows you to feel confident in utilizing a large assortment of material, as the sprayer will perform up to the challenge. Even with this being the case, however, it is recommended that you do not use any lacquer or textured paints. These materials can clog up the nozzle, tip or the gun itself, which could lead to some frustration and will cause you to have to stop and clean out the gun on a constant basis. This Titan paint sprayer can spray oil based paints, but the cleaning process does take a long time as well. Overall, this paint sprayer is one of the heavier ones on the market, but with the portability and the power it offers, you can rest assured you will cover the entire area you need to paint or stain. When it comes to finding the right paint sprayer for you and your needs, there are five great options listed above. Even if you decide to go with other options, you can help determine which one will be best for you upon knowing how much area you need to paint, and how often you need to paint. Plus, if most of your projects are inside or outside will also determine which route to go. We wish you good luck in finding the best paint sprayer for you and your needs!